The fall of the Berlin Wall was a monumental day that marked collective consciousness. 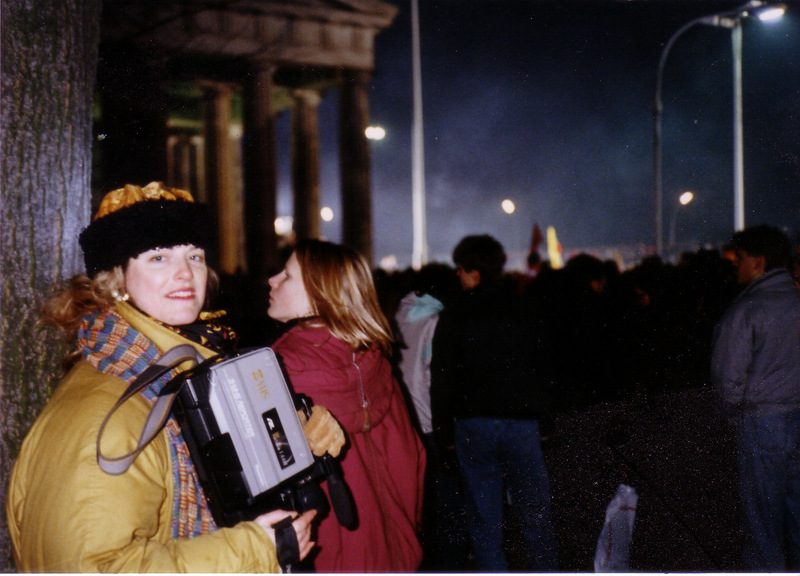 It was commemorated on Sunday, November 9th in a united Berlin, as tens of thousands of people gathered at the Brandenburg Gate for a 'citizen's party' markng the 25th anniversary. An art installation titled ”Lichtgrenze” or “Border of Light” featured 8,000 illuminated white helium balloons positioned along the nine-mile path tracing the former wall. They were released into the night to music and fireworks. This area was known as the ‘death strip’ due to those who died trying to flee Communism since the wall was erected in 1961. The release into the sky was a reminder of that moment in the minds of many that heralded the collapse of the Cold War and opened the possibility of freedom everywhere. I was there at New Year’s Eve in 1989. That morning I walked along the cast-concrete wall and went through the infamous Checkpoint Charlie to East Germany, which was still a functioning border control station. The contrast between the two sides was huge. That evening, the borders were criss-crossed from both sides by tens of thousands of Berliners. They jubilantly greeted each other and danced on the wall. The East German guards lowered their guns and stood aside. A peaceful revolution had ended political oppression. From that moment, the sound that dominated was that of sledgehammers and pickaxes as thousands of Germans tore down the wall by hand. National unity came for Germany on October 3, 1990. What led to the fall of the Berlin Wall? It was an event preceived globally as having international significance and many world leaders took credit. However, East Berliners say it happened because East Germans made their voices heard in massive “Wir sind das Volk” (We are the People) Monday Demonstrations in Leipzig and other cities in the fall of 1989, along with the fact that hundreds of East Germans had been able to make their way into Hungary and Austria as refugees and were asking for permission to emigrate. It was a mind-blowing and unforgettable time, wrought with risks, rewards and revelations about potential for the world. However, the time in Berlin was also infused with the extraordinary tension of trust and distrust… no one really seemed to know what to expect. 28 December, 1989 – January, 1990, Berlin: I remember how I felt the first time I saw the Kaiser Wilhelm Memorial Church in 1983 with that neo-Romanesque spire…gone. Its fragmentation was my fragmentation. My fragmentation was the complex American fragmentation. Fractured parts survive isolated in all directions, without explanation. Memories like old sacred places with riddled walls still reach wounded and incomplete for political heavens. Now a monument, a tomb, archeology constantly reinterpreting a shocked culture, infused with a new generation of blue light. Our franchised faceless bodies, incomplete anatomical particles, are part of the irreversibility that masses, assimilates and flows in that blue from the past to the future. Six years later at Checkpoint Charlie the sardonic sentry still stand armed with machine guns, so faithfully. We again waited like criminals by a wall covered with the colors of freedom on one side, and Honecker’s no-man’s barren white, on the other. The day was drenched in eerie liquid grey and pent up ecstasy. Giddy laughter and even hysterical cries of joy came from all along the Berlin Wall as people chipped away with picks, hammers, chisels and rocks. But we still felt fear as we crossed over. Only a few months ago six people were shot trying to escape. Then the day released freedom like an undammed river flowing to the ocean as it filled with the enormous celebration of a revolution. It was clear to me that I was living in a time when the evolving social organism, the sea of humanity of which we are all a part, had become molten, open to an unprecedented expansion of consciousness and change, and the half-a-million gathered at the Brandenburg Gate were but one indication. Special messages passed through the nerves of the hands of the masses, as one person after another was pulled onto the top of the wall. The body understands what our sight does not see. I kept looking into their eyes through my video camera. I’d move in so close I’d feel embarrassed by the intimate pain. All their struggles remembered would now be different struggles. Fledglings at freedom with punished faces, many destroyed, confused, moved with their hearts unbound. I felt great privilege to be sharing all of which was new, the power of the once powerless. A woman in her forties passed me a small, lit candle. She was lean, vulnerable and pale, yet overflowed with exuberance. Indomitable spirits soared, overpowering future and fate in smiles and tears. My eye was seized by the weary, knowing eyes of a young man, maybe twenty-five. I pondered their future, my future, the future of fragile freedom. I asked myself: at what point does documenting become surveillance? I suddenly became gripped with fear and felt sure that a strange caution must be taken. It could be a barbarous decade. The shock of breaking down one wall might not break down another. The wall was change. I saw those who would only survive by the absence of change vs. those who would profit most from change. A mighty surrealistic time. The haves vs. the hungry all over the world. Joy and fear leaped up and announced a new era, bodies in lust to control how they live cried and sang in an awkward union with the other side. I slept for two hours. When I woke up, I began trying to articulate the hope, fragility and danger I felt for the decade. I thought to myself, "America will not cooperate, I’m sure. Our government will resist peace in a world it did not create, at any cost." My eye began to fill with blood. Walking through the snow, I thought about the eye in mythology, the eye as a male symbol associated with aggression, the stare. Last night I had felt for the first time a different power of the camera as the extended eye. The extended I. I felt the strategic power of the eye that dissects. The possibility to blind. The potential to fragment vision and intimidate by distortion. I had, of course thought of television as a medium for propaganda before, of the mask of interpretive voice over image, but I had not thought the eye of television as an articulate weapon in the heat of minds. I had not thought of the social consequences of mirage as authentic image. I had not thought of the deadliness of who controls and who sees, of mass awareness and mass binding, events exploited and history erased––the damage of vision as a direct transmission. Unaware of how we remember, we believe images, but we feel form.